After the encouragement of taking 10 points from their last five games Leeds United head coach Thomas Christiansen will be hoping his team kick on further with back to back home games now on the horizon. The Whites return to Elland Road this Saturday just four points off the play-off places and aiming to close the gap again when they take on a Norwich City team down in 15th place. Christiansen is wise enough to know that it will be no walkover, especially with Norwich ending their eight-match run without a win last weekend as they came from behind to beat Sheffield Wednesday 3-1. But the United boss has been encouraged by recent displays by his side as well as the points they have picked up and reckons they will not lack confidence to deliver in front of another expected big crowd. With another home game to come the following week against Hull City the opportunity is clear for the Whites to show their fans whether they are genuine promotion contenders and they are taking aim at a top six place to start 2018. Their latest victory, at QPR, did come at a cost, however, with a possible striker crisis ahead and no end in sight to the goalkeeper woes that have dogged Leeds in recent weeks. A potential serious injury suffered by Caleb Ekuban on top of Pierre-Michel Lasogga continuing to be unavailable for reasons that have not been made clear have left United with only Kemar Roofe looking capable of leading the line – unless there is a dramatic turnaround in performance level of rookie forward Jay-Roy Grot. Roofe has done a more than fair job when stepping in as a “middle man” this season with two hat-tricks to his name now – and a strong case can be made for him being first choice now – but obviously if he was to pick up a knock against Norwich it would give Christiansen a huge headache. Christiansen told reporters after last Saturday’s game that he feared Ekuban had suffered a recurrence of his previous injury and the player left QPR’s ground on crutches and in a protective boot. The 23-year-old centre-forward had made an impressive return from injury after signing from FK Partizani in the summer only to suffer a broken foot on his first Championship appearance for the club against Sunderland in August. Ekuban missed 12 league games before his return coincided and certainly played a part in an improvement in United’s performances last month. At the other end of the pitch, the already fragile confidence of goalkeeper Felix Wiedwald cannot have been helped by his massive misjudgement that led to QPR’s goal as he let an innocuous overhit pass into the area bounce over him. 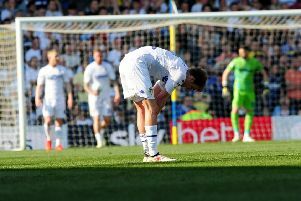 It was a real schoolboy error and could have cost the Whites the win they had worked hard for, but Christiansen refused to criticise his goalkeeper. Asked what he said to the player after the game, he said: “Congratulations! What should I say? Thanks for saving two or three opportunities. Leeds fans were not so charitable on social media and Wiedwald faces a tough job to win over fans, although the public support of his boss can help after his confidence was hit by being dropped earlier in the season. His replacement, Andy Lonergan, did a good job initially before he too made several errors that resulted in goals and there have been many calls for the club to go out and sign another keeper when the transfer window opens next month.